How Might Custom Louvers Benefit You? Custom louvers have a whole plethora of benefits. Have you heard of them and do you know what they can do for your commercial property? If you own a commercial property, there are a lot of concerns. Everything from landscaping to security are major issues for commercial property owners so it’s best to take the time to research what priorities benefit you the most. Here at Hercules Louvers, we believe that custom louvers are a fantastic way to spruce up your property, create a sense of professionalism, and really establish yourself within your community. Louvers have some obvious benefits but they have some benefits that aren’t as clear as well. Here are some major ways custom louvers can benefit commercial property owners. If you have a need for privacy on your property, either because you have customers or clients who need to keep their info private or your property is within a community, custom louvers are a fantastic option. Unlike other fencing options, louvers prevent peering eyes from even possibly looking through while still keeping airflow and a sense of openness intact. Sometimes, you just need to make your property look distinct from the rest of an area. It’s good to make yourself look like a business, especially if you’re based in a mixed development zone where it isn’t always clear where businesses begin and housing ends. Try using custom louvers to show people who you are! Sometimes, you need to control who goes where. Keeping your employees from accessing areas they shouldn’t, or even just don’t need to, is often a useful tool. 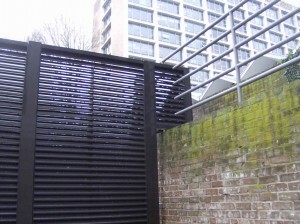 Custom louvers can be used to establish perimeters and make it clear where people ought to be. At the end of the day, a big part of professionalism is about looking like a professional. You want to set yourself up as someone who cares about their work and takes their profession seriously. Louvers go a long way in making your facility look like you want it to. On top of that, aluminum custom louvers look fantastic and require very little maintenance, meaning they will continue to look great for years to come. For anyone concerned with security, there are few options as useful as custom louvers. They’re just about impossible to scale or get past through traditional means, so you can be certain that no one will be getting into your property when they shouldn’t be. This entry was posted on Friday, November 9th, 2018	at 4:29 pm	. You can follow any responses to this entry through the RSS 2.0 feed. Both comments and pings are currently closed.